Well, the three days of sun were GREAT while they lasted. Today is back to being cool and drizzly. I've had some issues with my computer lately - it seems I can only open certain blogs with Mozilla, while the rest are fine on Opera. I use Opera for my work all the time, so now I have to switch back and forth between browsers just to be able to read my favourite blogs! Entrecard has introduced the ad network in its beta version today, which might explain why the ads I've placed (the regular ones, not paid) have gotten zero clicks! Strange. On to more pleasant news. 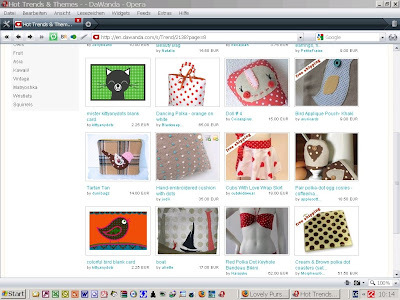 Dawanda has introduced a new hot trend in their 'trends & themes' category: polka dots. Well, as most of you know, I love polka dots and use them frequently for my bags. I was (pleasantly) surprised when I saw they picked one of my minibags with the birdie appliqué...although I had this minibag tagged as tartan. Funny that. Okay, the birdie is made up of polka dot fabrics, so fair enough :) You can see my bag in the first image of the middle row. It's the tartan one, just in case anyone mixes up plaids with polka dots. hehehe. That's it from me. Better get the house cleaning started and the grocery shopping done, so that I can get down to some serious sewing! Have a terrific weekend. The bag looks stunning...a terrific creation, well done on it. Thank you for your kind words on my blog when I was stressing. They were much appreciated and helped me get things back into the right perspective. I won't be such a baby next time, lol! We finally have sun this weekend! Hopefully yours returns soon! Congrats on being picked on Dawanda! Congrats on the feature! :) I hope you get some more warm weather soon. Congratulations on being featured by Dawanda. I remember seeing this bag when you first posted it on your blog. Very cute. The weather seems to be yuckky everywhere because, we're having one of the worst snow storms this weekend this winter. I'm so glad that I'm off. I hope that it warms up today also. Aren't dots fun? Congratulations on being picked. Congrats on your pretty bag and for being picked as well! I also use Opera and Firefox here. I prefer Opera but sometimes have to use Firefox for certain tasks, like creating blogger posts. Opera has some formatting problems when you put pictures in the post sometime.